Hey folks. I want to start this thread with explaining my situation. I am a member of a club which has a very mixed bag of members. We operate a layout in that is meant to be on display for John Q. Public to come in and see on the weekends, so 90% of the membership just runs whatever they want as the Trainmaster allows based on traffic at the time. During a visit to our layout you may see a modern BNSF unit train pass a westbound 1930's passenger train headed up by a heavy 4-6-2, or you may see my 1970's Milwaukee Road power rubbing shoulders with a 1955 CB&Q Zephyr. We don't really have a rhyme or reason except to put on a show for the viewers. Here's my problem: I want to operate. The club rules do not discourage it, and we have plenty of track and industries to do so. The bizarre clash of eras passing by doesn't bother me as I just dismiss it as traffic. My biggest concern here is other members may come along and move my cars out of a particular industry, or off a particular track so that they can switch that industry. We're usually pretty good about not disturbing other members' cars or trains, but it has happened in the short time I have been a member. So here's my question. What would be the best way for me to run any kind of freight operations? I have access to two mainlines (east & west), a classification yard, a branch line full of industries, and a small urban area along the mainlines that also has industries. Our largest industrial sector is not yet up and running but cars bound for those industries can simply be tied onto a mainline consist and run on the main into staging. I'm just not certain which system works best for me here. I'm not at all familiar with car cards, but I can't guarantee 100% that my freight cars will stay where I leave them. What should I do? Without some sort of switching plans/programs in place that everyone will have to follow and respect, then only chaos can result. I know there is one club quite some distance from me that has such programs, but in that club's case, the club owns all the locos and rolling stock on the layout. Membership is restricted to a certain number, new member applicants have to wait for a vacancy to occur, and the fees are fairly pricey. And then they have to take turns on an operating roster, which, when that happens, the operators are given a switching list, the locos to use and the cars to be switched and where, all by timetable. Even at the club where I run, which has quite a number of yards but few industries to switch anyway, and fewer sidings to spot cars on, so that only one person can do much of that. That sort of "works", first in first served, others just run trains. I would say in your club's case, some "running rules" are going to have to be negotiated and agreed upon. I was a member of the same type of club. The club was the "Baby" of the guy who started it. During the tourist season (Summer) the club was open to the public from 6:00 to 9:00 pm on Friday and Saturday Nights and we were supposed to have trains running on a two track main and a fairly long branch line. At general meetings, I tried to talk the club into doing operations and switching to DCC. The club members where not interested in either idea. I joined this club after construction of the layout, for the most part was complete. However, I kept my interest up by adding a staging yard to the layout, building and installing a very nice Turntable kit which the club had bought and cutting into the layout and installing a two track steel arch bridge which one of the members had built. I lived 35 miles away from this club. I drove to the club on several operation nights and ran my trains for the very few visitor which came to see the "Trains". After a couple years of being a very active member, I found myself board with driving all that way, to just run my trains around the layout. I quit the club after only a couple years, as I found the basis for the Club as a "Tourist Model Train Show" to lack much depth. I'm unsure of when; but, the main guy died, and a few years later and the club just fell apart. My gut feelings about this club is the reason for it's existence failed to hold the club's collective thoughts on what the club was about. Very similar to how running trains around and around on your home layout gets rather boring in a fairly short time! I would suggest to you Dakotalove39 that as a member, you need to get the club active in operations; or, the same possibility might befall your club! To just operate trains for tourists is boring! Without some sort of switching plans/programs in place that everyone will have to follow and respect, then only chaos can result. That's exactly my concern, yes. I have noticed, however, that since another guy started operating on the layout with car cards no one is willing to disturb his cars at all. I don't know about you, toot, but I have no idea how car cards are supposed to work, how they are generated or how they properly govern movements. The majority of our members are older folk who have a hard time crawling under our island-style, free-standing layout to work the switch controls, so it's understandable that they just want to watch their trains roll. That said, there's a few of us younger guys who want to do more operation. I see you get it, though. From a pure business standpoint in our case, we can't really change how the weekend showings work. It's okay to get behind the fascia once in a while and throw switches to shuffle cars around, but we have to maintain that theatrical model train performance because the people who are there to see it have paid (only a little bit) to see it. Really the only thing giving me hope is that our branch line district is essentially a free-for-all, and it's what has most of the industry to work. This is one of the reasons that I'm not a member of a club. Well, not this specifically, I'm not that interested in operations. It's that the local clubs are all specifically for eras that have no interest to me personally and unfortunately the main options are to either find a way of convincing the members to change their rules, create your own club or just create your own home layout and run it by whatever rules you feel like having. Personally, I went with the latter as building is what interests me the most. I may someday see about creating a club. In this case, probably the best case is to make a case for there being some time set aside in proportion to the number of members that want to do operations. If most of the club doesn't want to do operations, it's probably not going to be much time and it's probably going to be the worst time slots, but that's probably what you're looking at. Otherwise, everybody is just going to annoy each other or continue with the status quo. Who knows, maybe if folks get to see and work with operations, they may decide they like it. Sadly that's a bit of a difficult sort of environment to do any sort of formal operations with cards or switch lists when everything could be moved around by someone else, or even if it doesn't get moved on you, you're limited to operating only a few different spots that you "control". you're limited to operating only a few different spots that you "control". How is that different from actual railroading, though? I'm not "up" on car card systems either, although I imagine there's either books or web pages on the subject that explain how they work (they may not all work the same way). I think as a first task, it would be necessary to work out the various routes on the layout that would enable a train to be created to service the industries and stations along a route, so the types of cars that those industries etc will need, can be assigned and classified in the departure yard/s. Trains could have long runs or shorter ones. Where the greatest difficulty might arise is if you want to get as complicated as interchanging cars with other members. I remember buying some box cars at a buy&sell that had the owners "mark" on the bottom, obviously so cars could find their way back to their owners at the end of a session, just as the real railroads do with their Reporting Marks. Car Cards are easy enough to explain: Position One, is where the car and load originated from, a business. Position Two, might be the end place the car is going, or the second step along the route the car/load must pass through. Position Three, might be the end place the car is going too; or, the third step along the route the car/load must pass through. Position Four, might be the end place the car is going too; or the a description of the return route the Empty Car heads after it's use. I generally use two positions, where the car/load originated and where the car/load is going too. Example: A box car is loaded with miscellaneous freight from a supplier: The Car Card Position One: Shows the type of car. who is handling the car, the address of origination and what the load is, in this case General Freight. Upon it's arrival at it's destination, The card is turned to Position Two: The freight is unloaded and the load now becomes Empty; or MT. and the car returns to where it originated from to cycle again. This is a greatly simplified version of using Car Cards. Sometimes a car will need a third position as in Refers which need Icing before delivering to the place where perishable products would be loaded, beer, meats, etc. 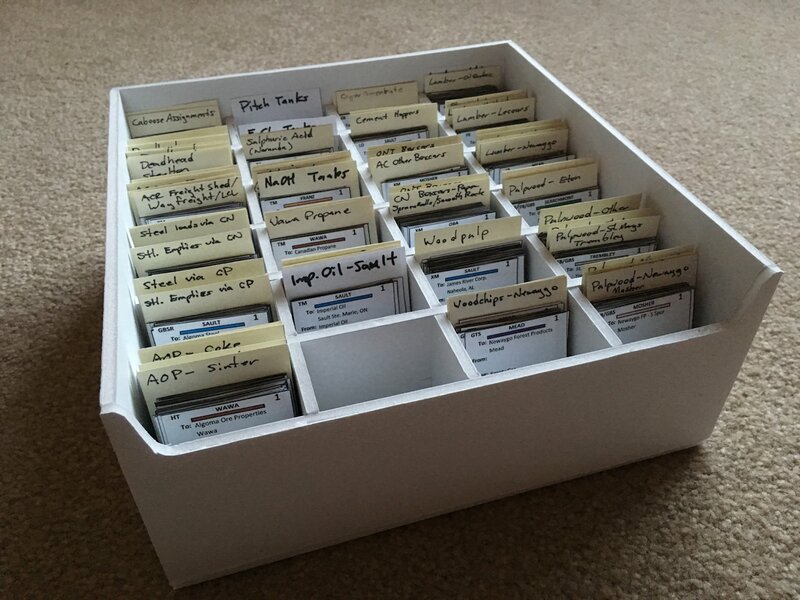 This is how I use my Car Cards, others might have far more detailed descriptions of how they use the cards. I know nothing about switch lists, other than I think they may need to be generated for each movement. Someone else can describe their use better than I can. Car card systems basically represent a shipping waybill for an individual car. A real waybill for a loaded move gets filled out with the shipper, receiver, lading (contents), and car ID (reporting mark + number). (Plus a bunch of other information on freight charges and billing but we don't really care about that at this level. A long time ago, someone came up with the idea for the model railroad to separate the car info and shipment info into two pieces of paper that can be combined, so the paperwork is reusable. Usually you have a card for the car - containing the car reporting mark, number, type and optional description information like colour, length, etc. - which has a pocket to insert another piece of paper with the shipment info (from, to, contents). Because the "waybill" part is usually inserted into a pocket in the "car card", leaving only half of the slip visible, two or more (if printed double sided) moves can be on one waybill which is rotated between sessions to the next move. A "move" is the entire trip from origin to destination, including whatever number of yard and interchange stops and connections it needs to make in order to complete the journey. - three boxes for the whole station, with a box for "Set off", "Hold", and "Pick Up". All car cards for cars that need to be picked up will be in the "Pick Up" box, and the crew will need to find which track/industry they're at (usually easy by reading the "From" line on the waybill insert). Cars that the train drops off will be placed in the "Set off" box. Usually waybills are rotated to the next move between sessions by the layout owner or designated person. (On most layouts an operating session represents a schedule for one working day.) For a continuous "show-running" operation like described in the first post, you might rotate them when the cars are set off so the next train through can work the station again. Advantages include total reuse of all paperwork - car cards and waybills only ever need to be printed once when you set up your system; the system has been described as "self-healing" in that if a car can't be placed where intended or misses a connection in the yard the card is simply kept in the same location as the car and the next train through will handle it naturally; no computer data entry between operating sessions. Disadvantages include having to handle a card for every car in your train, and crews have to flip through the cards to see where cars are going and which ones need to be picked up or dropped off. One "disadvantage" that some people trot out that I don't agree with is that the system is "too rigid" with each car constantly rotating through the same 2-4 moves. Well sure if your lack of imagination leads to you permanently keep one waybill with the same car. If you remove and replace waybills after they complete the final move the system is very flexible. Switch list systems track the car's location and destination in a computer, and print out an entire list of instructions for train, telling which cars to pick up where, and which cars to set out where. All the layout and car data must be entered into the computer system and kept up to date and accurate. Advantages include less individual pieces of paper to handle, and all your work is described for you on one sheet. Disadvantages include having to print fresh paperwork every session; the computer has to be updated when the list is complete, and if any car could not be set off in the correct location because of a full track, missed yard connection, or someone made a mistake, etc. the system has to be manually corrected. Scheduling, routing and dispatching entire trains is a completely separate component of operations than individual car routing. Where the greatest difficulty might arise is if you want to get as complicated as interchanging cars with other members. Unfortunately I've gotten lazy with applying my personal "stamp" to each of my cars (now up to 65+). I'm mostly concerned with my own interchange, as I want to get a couple locomotives of C&NW, RI and MN&S to "interchange" with my Milwaukee trains. And that's where I am stuck. A. What generates each waybill/car assignment? B. How do you ensure you aren't mixing things up and prevent your boxcars from somehow taking coal loads or your hoppers from taking pulpwood? That's something I wouldn't touch. My ideas have been very streamlined to suit the nature of my particular sandbox. 1. Assemble "inbound" train in staging either out on our main lines or in the branch line staging. 2. Bring inbound train to Hennepin Yard. 3. Turn over to Local and Interchange crews to break-down and disperse. Inbound train becomes two at this point, one section going up the mountain and the other to the harbor town. 4. Locals return to Hennepin Yard with pick-ups which are built into an outbound train. I am the only original member of our RR club. From the very beginning, it was designed for operation. We started with members cars, then the club bought or accepted donations of equipment until we finished the layout. Now all the equipment is club owned and member owed cars are not allowed on the layout during operations. We started with DC, then went to the Mann Made system, and finally wound up with Digitrax. We use JMRI for manifests and yard reports, and use a print out to make sure the cars are where they are supposed to be after the session is over. So far that has worked out very well for us over the years, with only a few hiccups. We have a dispatch panel in the back room that controls all the mainline switches and also shows locations of the trains. We also have a staging area back there with 3 different cities represented. The dispatcher assigns the trains and controls the switches and movements. We have 2 large yards out on the layout that are manned by permanent yardmasters. The only problem we have is that the large majority of us are over 70 years old, and getting under the layout has become much more of a chore. Chris - Your explanation is far more simple than I could have described. Well done. On the old layout, I had a divided box with a slot for boxcars, another for reefers etc. When all four "moves" were completed, the card went into the back of its slot and a new one was drawn from the front. I had dozens of different scenarios for most equipment. I'll answer the second question B first, because it's the easy one. You put the required car type at the top of the "waybill" insert, and match the car card and waybill types. Here's an example of a few car cards/waybills I made for my railroad. Note the top left corner of the waybill insert has the car type code matching the car card. For question A I think I know exactly what you're asking, but I'll answer a couple of questions here. 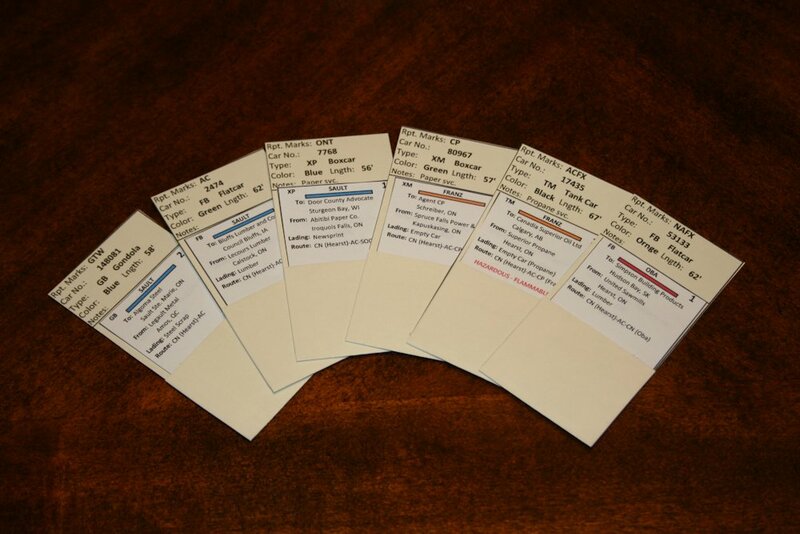 For making the waybills, there are some programs out there (some freeware, some paid) that are specifically design to print model RR car cards and waybills. You can also do what I did and use a spreadsheet program to make your own. Regardless of what system you use choosing origins and destinations for your shipments is up to you. - Keep it simple and keep waybills permanently assigned to a car (I know I said earlier you don't have to, but the point was you don't have to if you want more flexibility and variation). - If you're basically starting with a fixed train out of the yard/staging, pull an appropriate number of waybills based on the car types of the cars you have and assign them to the cars. i.e. when your train arrives in staging, pull the old waybills and replace them with new ones for the correct type of car. To get started for the first time, "seed" a bunch of your industries with cars, and give them matching waybills for loads (or unloaded empties) leaving those industries (these are probably all on move "2"). ^ This. I left this out of my post above, but this is important for the "assigning new waybill" in order to keep rotating through all your waybills. So you can introduce some variety into your traffic by printing multiple waybills with different destinations. My sorting box has a few more slots as I have things sorted into more things by type of traffic and industry etc., not just car type, but exactly this concept. Oh, I see, so you guys do it just like drawing new cards in a cardgame. I'd have to figure out a safe place to keep my car cards, then. There's no pockets on the layout to hold onto any. Whatever is "out" on the layout could be kept on a clipboard, same for the ones I am working with. How do you handle cars that don't have a place on the layout? For example I have one autorack and one Vert-a-Pac car. These don't have industries on the layout to go to and I have always considered them to be "through-freight" and nothing else. The waybill move would have an origin and destination that sends it from off-layout staging on one end of the layout to the other. Some people simply through waybills by putting a slip in that just says "Through East", "East Staging", whatever. I kind of like the consistency and "scenic factor" of having shipment information that feels like the through cars are actually handling through traffic. I'm not sure of the configuration of your club layout, whether it has a two ends or is just a "running loop". A loop with no staging complicates the concepts of staging and "beyond the basement" when there's no "rest of the world" connection modeled. But whatever "destination" your cars getting picked up from the industries and going back to the yard/staging/rest of the world have can be applied to the through cars. My own layout, and the club layout I operate on (especially the club layout) has a not-insignificant amount of "bridge traffic" due to the geography of the line that runs between one staging or connection point and another without serving actual on-layout industries. Yes that's a good description except there's multiple decks to draw from, for the different car types and/or industries. The variations come in deciding how many to draw from each deck. Then you assign them to matching cars without waybills. I made it in an afternoon out of foam-core board. We have a larger wooden sorting box at the club for our waybills there. Lots of detailed pool breakdowns in that operating scheme. As described by Willie, when waybills are removed, they get sorted and placed at the back of the appropriate slot. New ones (however selected) are drawn from the front so they all get cycled through eventually. That's kind of how I always saw some of my cars. I have about eight "specialty" cars that don't have any kind of theoretical destination or origination on the club layout. My automotive cars are one example, as are my two Carbon Black hoppers. I forget the exact term for it but I'll explain our track design as such. We have two mainline loops that run parallel to eachother around the entirety of the layout, and both eastbound and westbound have their own respective staging yards down underneath. I guess they would be called run-through loops with staging? There is one single classification yard accessible by both mainlines and the branch line and it's pretty much at the heart of the layout, and coincidentally where my trains usually call home. The "west" end of the yard is where our branch line originates, with the "east" end being the connections to both mains and the branch staging. If we assume I am only concerned with the mains for inbound/outbound trains, then that still leaves me with the branch line, its staging yard and the classification yard. On the photo above you can see our classification yard (beside my friend Henry's Amtrak hat). The branch line originates with that yard and goes all the way around the layout to the mountains way in the upper-left of the photo. I did forget something that factors into any desire I have to operate. I don't yet have a key to the layout room. I think I will get one sometime in February. Once I have that I can go to the club layout any night I want (or stay late on weekends) and futz with my trains there.